Usually diamond-shaped and yellow, these “warning signs” caution drivers that the road is slippery when wet; there is an intersection ahead, the lanes narrow, or there may be bicyclists, farm animals, or wildlife on or near the roadway. Somehow cyclists are supposed to be comforted by the notion that Big Brother is “protecting” us by putting out a “warning” that we are nearby – as though we are a hazard to motorists, like deer leaping from the woods or kids darting out after a ball. The whole point of the “SHARE THE ROAD” signage seems to be to tell motorists that they ought to “share THEIR lane” with cyclists. I wrote this piece in 2010 – and nothing has changed in the interim to cause me to update, change or modify my view that “Share The Road” STINKS” – both as a legal concept and as State-Approved verbiage on a big yellow traffic WARNING sign. Is a bicycle on the road an “unexpected condition?” Is a bicycle on the road something that is “not readily apparent” to road users? Does the STR sign call for a possible “reduction of speed” or an action by a motorist “in the interest of safety?” Who is being asked to “Share?” And, more importantly, what is it, exactly, that is to be shared? “Share the Road,” to me, is absolutely obsolete, antiquated verbiage that arose during some era when bicycles were viewed as toys and bicycle operators were not treated, or taken seriously, as lawful vehicle operators driving around with a “right of way” superior to those coming up from behind in cars, trucks and busses. This language comes from an era which didn’t want to recognize that the cyclist, the vehicle operator, was entitled to exactly the same respect and rights as every other vehicle operator. “Share The Road” has NO place in today’s transportation lexicon and certainly no place in today’s LEGAL analysis of right of way. But this is not the law. Rather, the law is that a PERSON wishing to use the public roads has the right to CHOOSE the vehicle on, or in, which to travel. A bicycle and a car and a truck and a bus and an Amish buggy and a large piece of farm equipment are equally valid, legitimate and lawful choices as vehicles under the laws of virtually every state. This is the Critical Point here —>When it comes to the right to be on the roadway, and the right to move ahead in a straight line, a person who chooses to ride a bicycle on the roadway has exactly and precisely the same bundle of rights as one who chooses to operate a car. The Virginia court said, in Thompson v. Smith: “The right of the Citizen to travel upon the public highways …. includes the right, in so doing, to use the ordinary and usual conveyances of the day, and under the existing modes of travel….” In this case the tension on the roads was between cars and the horse/buggy configuration but the court’s use of the phrase “ordinary and usual conveyances of the day” is certainly broad and bicycles, having been around longer than cars, certainly fit the bill! Of course, good quotes cannot just be strung together to make a real legal argument in a real court case, and none of these cases are “bike cases.” No court has held that there is “constitutional” right to operate a bicycle on the roads. However, it seems very clear to me that virtually every court in the country would be forced to agree that you have a fundamental right to use the public ways, the roads, to move about the country. So long as your vehicle choice is one permitted by state law and you obey the traffic laws, you have the right to use most public roadways for bicycle travel. In Ohio, and in every state, citizens have the right to choose to use a bicycle and operate that bicycle on just about every public street in the country. So the PERSON, the “citizen,” not the vehicle, possesses this “right to travel.” But, once you’ve walked into your garage, looked at your car, your truck, your motorcycle and your bike and chosen to head out on the public way on your BIKE, what “rights” do you have while operating your bicycle? What duties and responsibilities do you have? Most states say you have the SAME bundle of rights as the operator of other vehicles, and the same responsibilities. In fact, a common mantra among bicycle advocates is Same Roads, Same Rights, Same Rules! In general, the person driving “lawfully” at the front of the pack of “traffic” typically has the “right of way.” The rights of the operators of the vehicles operated behind, or passing, the leader are subservient to the one with the right of way. This “right of way” is a very powerful collection of rights which should not be given up, or “shared,” by the cyclist. Note – the word “share” is not in the law. There is no crying in baseball, and there is no “sharing” in the right of way law. So, really, this concept of “sharing the road” has absolutely no business being in the transportation lexicon. Advising a motorist who is coming up on a bicyclist from behind to “Share The Road” with the cyclist riding in the lane ahead is fundamentally and legally WRONG. You either HAVE the right of way or you don’t. The cyclist riding ahead of the car owns the right of way and does not have to share… in fact the cyclist shouldn’t “share.” Once the cyclist gets into a “sharing” mentality, the cyclist has lost the battle. You HAVE a “right” – the right of way – which is actually a very powerful collection of rights. However, you have to ASSERT that right – use it or lose it. The fact that you have a right means nothing if you don’t USE it. One instance when “sharing” may seem to come into play is in the Dance of the Passing Maneuver. However, even during this dance there is always someone with the right of way and someone whose “right of way” is subservient. The “Passer” is behind the “Passee” and wants to pass. The Passer initiates the dance – signals the intent to pass – moves left and begins to pass. At some point during the Dance of the Passing Maneuver, the the Right of Way baton passes from the Passee to the Passer. The Passee then has the duty to allow the Pass to be consummated. Passing laws generally prohibit “drag racing” and mandate the vehicle ahead has to “give way” to the passing vehicle at some point. This is not “sharing” at all. The Passer has legal duties she/he has to meet in order to be allowed to make a legal pass. Here’s an actual sketch of a nasty crash from a case I handled. A landscaping contractor in an SUV was pulling a large, homemade trailer on a narrow 2 lane road. 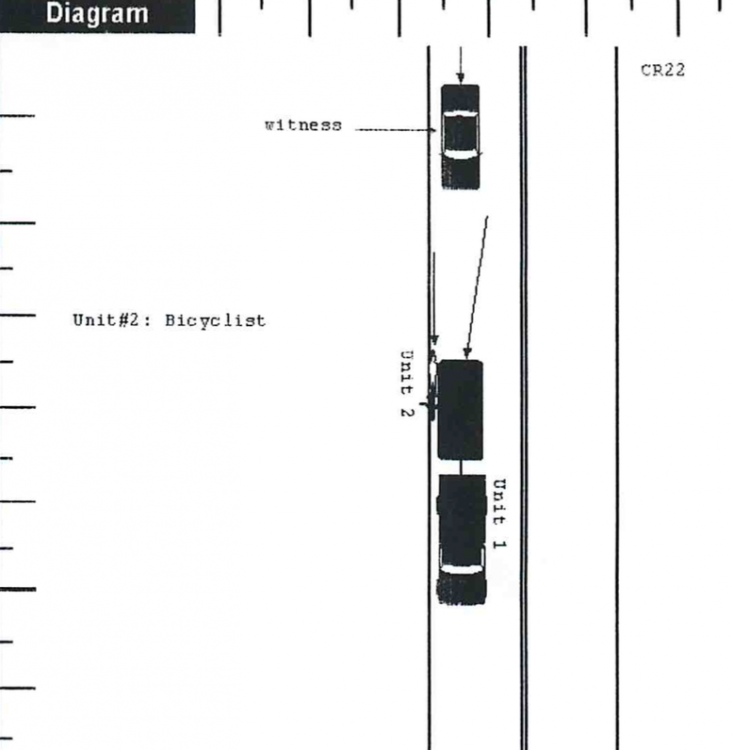 As he passed the cyclist, he clipped the cyclist with the trailer, causing a crash leading to catastrophic injuries. Police officers were actually sitting on the side of the road ahead the SUV and bicycle – they were facing the oncoming car and bicycle as the officers had pulled over another driver. The result? NO “unlawful passing” ticket was issued despite the ridiculous close pass which led to some horrible injuries for our client. Remember, the cyclist ahead of the motorist has the right of way – the right to proceed forward in an uninterrupted manner – a right of way that is SUPERIOR to the right of the passing vehicle. The operator with the right of way, as the preferred vehicle, has rights that are GREATER than other vehicle operators. The big problem with “Share The Road” signs is that nobody knows what they mean. A “Share The Road” sign may give the motorist behind the cyclist the wrong message – the mostorist may think that she/he can choose to share… or not… The implication of STR signs is that the bigger car has bigger rights that supercedes the right of the cyclist and that the operator of the bigger vehicle can CHOOSE to share… or not. 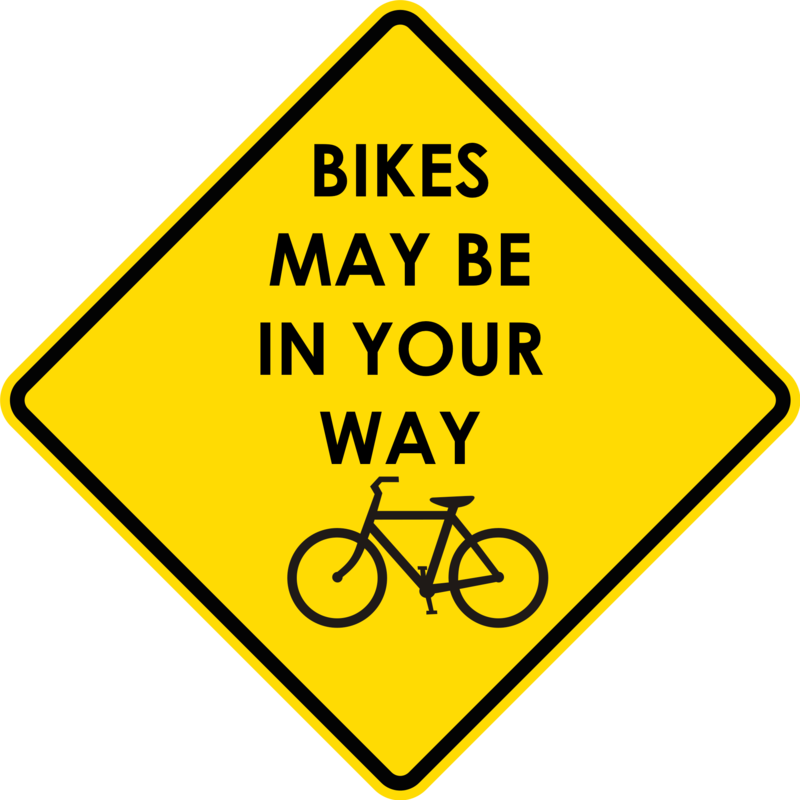 STR signs may also give the motorist the wrong impression that the LANE can be “Shared” with the bicycle – i.e., that they can co-exist side by side in the same lane. STR signs discourage motorists from leaving the lane to pass and tend to allow the motorist to think it is OK to try to “thread the needle” and pass the cyclist as close as possible without going over the lane line to the left. The Right of Way is valuable – it’s important – and it’s something cyclists should not be asked by the state to SHARE. FUNNY INSURANCE STUFF?? WHO KNEW? Perhaps a sign saying – Remember, cyclists have lawyers – would do the trick. Here is one that is not in teh CAMUTCD yet. It makes a specific statement that bikes belong. I think it is much better than share the road. My wife, a cyclist also, thinks that means get in to the gutter and out of my way! Maybe you already know about this, and just didn’t think it was worth mentioning, but here is another case that bears of the right to travel. At first I thought this was going to turn out to be a good article but it soon became obvious that the author doesn’t realize that the “share the road” sign applies to all users and not just motorists. Everybody needs to share the road, not just the automobiles. The bias in this article is so strong that you can simply switch the references to cars and bikes and have a completely opposite and still irrelevant viewpoint. With some motorists, it doesn’t matter if you ask, command, beg, or coerce them because they simply believe there is no place for bikes on public roads. Too bad we can’t deport them. Dangerous Driving is usually a criminal offence. Call 911 when you see someone driving dangerously. 1. Drivers drive cars. Cars do not drive themselves, as one commenter said, but others tend to mention cars as they are the controller. People control vehicles not the other way around. Further some say car and cyclists which are two differnt things. The correct use is driver and cyclist. So one cannot say that the car did not see me or cars cause collisions. The driver of whatever vehicle they are using cause collisions, even if the vehicle they are using, the car, is the most common and destructive vehicle to cause said collisions. By the way collisions are not accidents, but that is another article. 2. Cyclists do indead have the right to pass stopped vehicles (on the right or the left as long as it is on the road way). The law is written in most areas to allow a vehicle to pass on the right or the left. Now passing on the left can be safer for lots of reasons, but that does not outlaw passing on the right. 3. Motorists, in most areas, have more rules of the road then cyclists. For example, in Ontario Canada only a motorist is required to follow speed limit signs, not drive under the influence, or be assessed points on your drivers liscense. Many motorists only see the rights as they see it and think it applies to all road users. Further motorists tend to see rules as they know them rather than how they are really written. Let alone those that think the motor vehicle users own the road and only motor vehicle drivers pay for gas so only car drivers pay for roads, when in fact roads are built with taxes that all citizens pay. Very little of the road is actually built with gas taxes, Let alone all the police, ambulance, health care and environment costs that go along with roads. 4. A cyclists has the right to the lane, and until the motorists can pass safetly, and not cut off the cyclists in the process, cannot do so. Further the cyclists is not required to give up their safe lane position solely to let the car driver/vehicle to pass. I had a very heated discussion with a Quebec resident who thought that cyclists and pack cyclists had no business clogging up their roads to go on rides. Hello when you go for a Sunday drive in the country are you not doing the same thing the Sunday pack cyclist is doing. I’m wondering why you didn’t mention speeds associated with travelling on a public use road. For example: going 5mph on a road that is posted 45mph isn’t a matter of large or small vehicle but rather safety on a two lane country road. How would you address these concerns by some people in asserting “right of way?”. I think it would be wonderful to have a point of view on this! I think we don’t need to change all the share roads signs. How about a sign that says share the road not the lane. Give bikes the same room you would another car. As far as the example with you kids and sharing. We could have the sign say Share the road or lose your driving privileges for 1 year and get 5 points. It works on stop signs. Complete stops free rolling stops $117 and 5 points, your choice. Every user shares the road with every other user, the slogan does no more than stress that fact applies to bicyclists. To interpret otherwise is most peculiar- perhaps paranoid or delusional. Then why have a sign? THe purpose of the sign is to WARN motorists that cyclists might be in the way, and that they ought to “share” the road with the cyclists. These signs are never found in the tricky, narrow winding areas – only in the big thoroughfares where “sharing” is easy – The only paranoid or delusional thinking is that these signs have any meaning or do any good. I feel the same way about bike lanes, Paths or what ever you call the two lines that they expect bicyclist to stay in and which are dangerous to really be in. “Road belongs to all” is more like it or nothing at all. This is just to please those that complain so they can say that they are at least trying to protect people. I’ve been blogging for over a year and while always a bike rider, I became a serious daily commuter 3 years ago. I make many similar points about the state of ROW use in my blog and Google+ Page. Pleased to find you on the interwebs! I would like to know how much of the lane the cyclist is entitled to. That seems to be kinda vague. People always try to squeeze by when there is oncoming traffic. If I ride toward the center of the lane it seems to stop this. Repeating your point of view over and over again, and pretending you don’t know what Share the Road means is inane. “And, more importantly, what is it, exactly, that is to be shared?” Um…the ROAD. The thing you are riding your bike on. Bigger may not mean ‘more rights’, but it IS more might. Your soapbox is going to be in splinters, but by God you’ll be ‘right.’ Pffft. You’d think, from your post, the cars crash into bikes all the time. Somehow, though, Ohio remains one of the safest places to ride a bike on the road. Crashes are very rare – fatal crashes even moreso. No motorist WANTS to run someone over. Cyclists should be taking a road position that promotes their safety by making them as conspicuous as possible so as to enter the motorist’s consciousness as early in the game as possible. I’m not “pretending” to know, or not know, what Share the Road means. The entire point here is that the term is legally meaningless. You don’t “share” anything. The cyclist who is ahead of the motorist has the right of way. The motorist behind the cyclist has a set of rights that are less then, subservient to, the superior rights of the cyclist ahead. There is no duty to “share” the road or “share” those rights. As the dance of passing is lawfully performed, there is a hand-off of the right of way from the cyclist to the motorist… once the motorist zooms away the cyclist again has the superior right of way – which means the right to proceed forward without interruption. 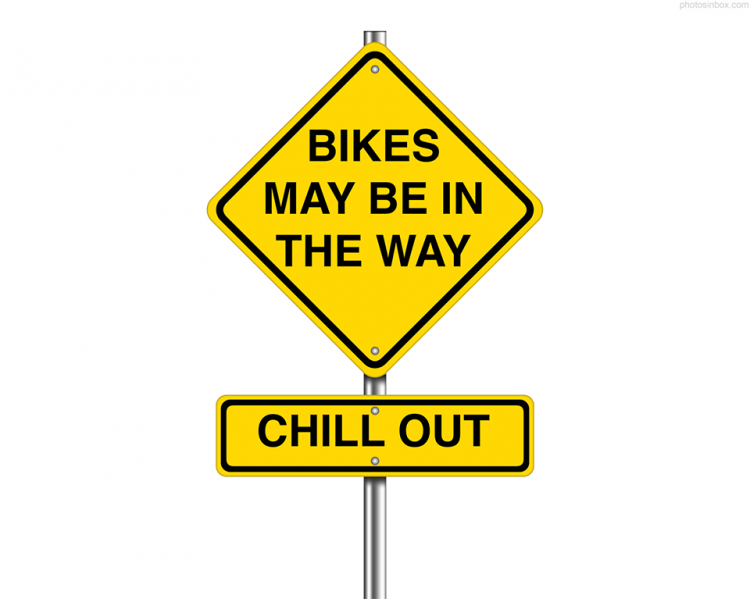 The threatening tone of your note [soapbox in splinters] implies a view that cyclists need to stay out of the way… this attitude is one which we have fought successfully since the 1880’s and continue to fight today.